Hold Up Half The Sky is an ongoing interactive sound & video installation project, using field recordings gathered while walking in rallies/protests in a handful of international cities from 2014-2017. This piece was begun when shooting footage of the sky during a manif in Paris in 2014, and I have been gathering footage since then. 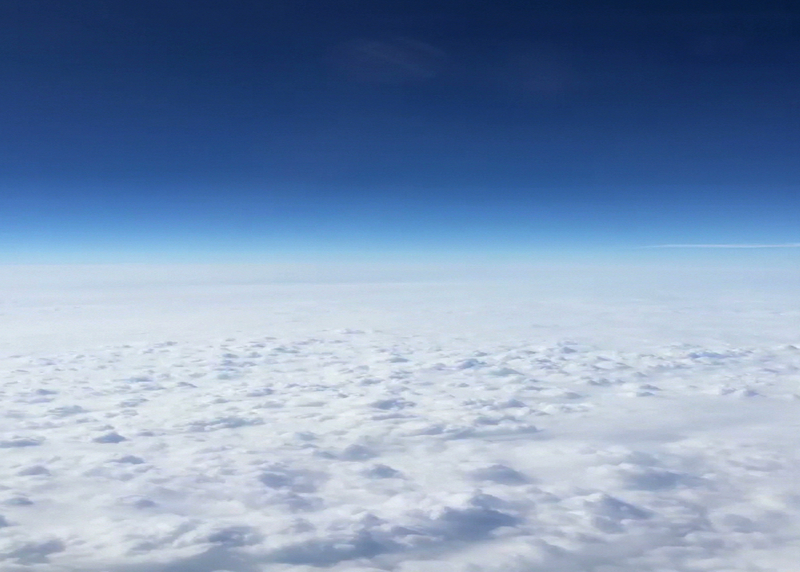 The piece also includes recordings of the sky captured from above, while flying. The protest footage was shot by holding a cell phone camera over my head and capturing the audio of the protest while walking, catching images of the sky above us and we wound our way through the streets or lingered in parks, and leaving out any identifying images of the protestors. This is juxtaposed with video of clouds from above when flying, shot out the airplane window. The piece contrasts the raucous, human, emotional sounds with visuals of the slow, ephemeral, drifting clouds or setting sun above. Two temporalities coexist – one of focused, immediate human strife and one of the of the earth’s continual rotation. The sky is the site of social power in many ways: surveillance devices, drones, satellites, missiles, and the like all occupy this space. And while the visuals of these videos are similar, the audio reveals the specificity of the experience of living under particular skies in particular moments: songs, police helicopters, screaming, chanting, different languages, alarms, etc. Playback of the recordings in the installation will be partially controlled via interactive hacked smartphones, set up in an “assembly line,” so that viewers can touch the tiny bits of circuitry that are responsible for playback, attempting to use their hands to control large scale projections of the sky. The hardware of these devices – made mostly by women in factories in China, who are hired in part based on the smallness of their hands – is used to control the vastness of the worldview imagined by the technologies. Different audiences may experience frustrations in interacting with the small bits of hardware and in controlling the recordings. I am also working on a “performance” version of the piece. The project speaks to issues of scale and globalization, the specificity of site, and the production process of smartphones, bringing a sense of materiality and embodiment to the capacities of the technologies. Hold Up Half The Sky takes its name from Mao Zedong’s famous saying that “women hold up half the sky.” I use the language to suggest the idea that collective efforts are required to keep a worldview in place, and seek in the piece to put together a less universal patchwork framing of conflict, protest, and boundaries, while drawing attention the perspectives of those below the sites of power and consumption.